From the moment of rebirth our future heavenly home was secured.. forever. From the moment of rebirth the life-journey towards that heavenly home began. It’s a march across the wilderness of life – a journey towards the promised land. I’ve no doubt that all the multitude that exited Egypt under the blood, are saved, for they were covered with the blood of the Passover lamb.. forgiven. They went down into the Red Sea and emerged on the farther shore.. and their journey through the wilderness dictated arrival at the entrance into Canaan. And all but two murmured against the Lord and all but two died on the journey and only two arrived in the promised land – with a rich inheritance. Their journey of trust or lack of trust in God dictated their future reward. From the moment of rebirth our future heavenly home was secured – forever. From the moment of rebirth the life-journey towards that heavenly home began. How important that we travel the journey of life, to make sure of our inheritance. How vital to live by faith and not by sight. It was not at the start of their journey that God judged to be the Israelite’s failure. God brought them to the very brink of the Jordan, in a few short months. The next day the land to which they had been travelling would be theirs, but at the last moment, their faith gave way to doubt and they caved into their sight: there are giants in the land – we’ve no chance against such mighty foes, they cried, we’re like grasshoppers to them, they said.. no one can help us in this dire situation. We’ll be crushed by the enormity of the task that is set before us, they wailed. 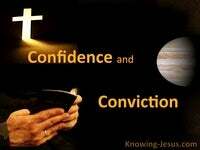 When the Israelites looked on the circumstances of life, their trust in God failed. The murmurings and faltering of the past days were not the issue. Now was the time to enter the land. Now was the time to trust the Lord. Oh, I’ve no doubt that an attitude of failure developed from their past murmurings, and once that point was reached, the rest of their life was passed in failure. From the moment of rebirth our future heavenly home was secured.. forever. From the moment of rebirth the life-journey to that heavenly home – began. Not one of us has reached the end, for the Lord has not yet returned, but now is the time to make this walk through life’s wilderness count. This life is a life-process of child-training. This life is the activity of sanctification. God has taken you to many bitter waters – but each time He has made them sweet. God has brought you to a point of parched tongues and then He has struck the Rock. God has brought you to a breadless plain and then poured down Manna in abundance. 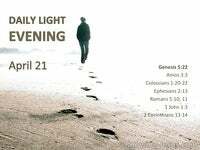 God has led you through many arid deserts – only to lead you to a refreshing Oasis. God has allowed Amalek to confront you, only to lift high His saving Rod. And now God is allowing many giants to test your trust in His unfailing strength. These colossal circumstances and giant problems are too tough for you to face alone.. But He has proved faithful throughout life’s journey, to this point. Can you trust Him now? Don’t allow the giants of despair to frighten you into hopelessness. The Jordan may be in full-flood, but place your foot in the turbulent waters in faith.. and He’ll cause the raging surge to be stayed and you will cross on dry ground. From the moment of rebirth our future heavenly home was secured – forever. From the moment of rebirth the life-journey towards that heavenly home – began. 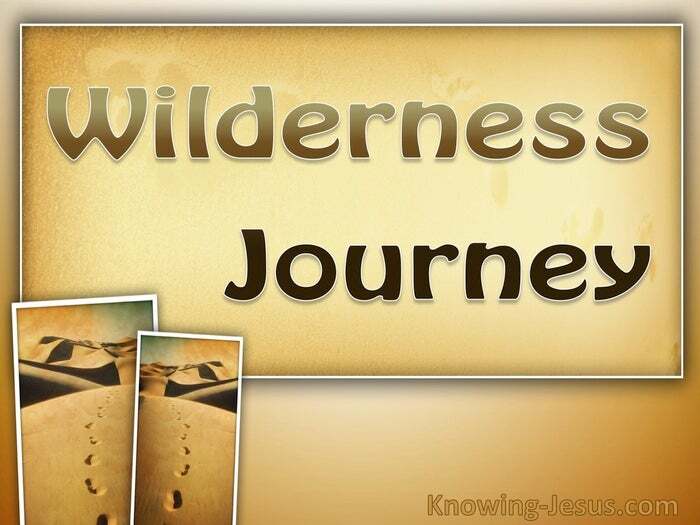 And as you journey across the wilderness of life towards the promised future hope, and as you daily continue in the process of sanctification and child-training.. 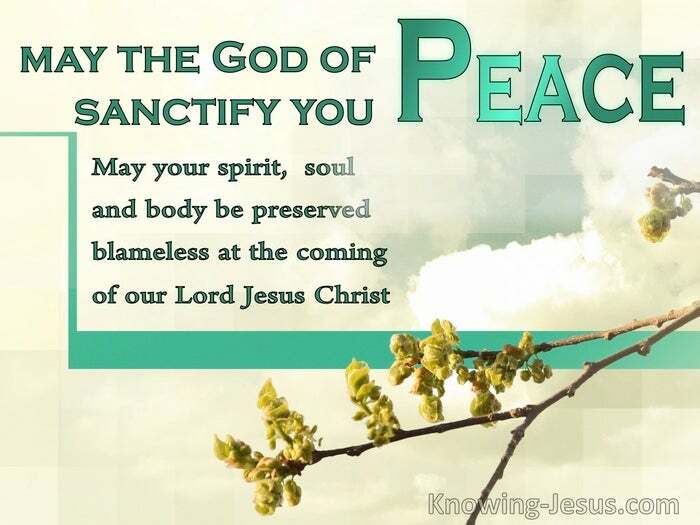 I pray that your whole spirit, soul, and body be preserved blameless – at the coming of our Lord Jesus Christ.